The presence of natural and industrial jarosite type-compounds in the environment could have important implications in the mobility of potentially toxic elements such as lead, mercury, arsenic, chromium, among others. Understanding the dissolution reactions of jarosite-type compounds is notably important for an environmental assessment (for water and soil), since some of these elements could either return to the environment or work as temporary deposits of these species, thus would reduce their immediate environmental impact. This work reports the effects of temperature, pH, particle diameter and Cr(VI) content on the initial dissolution rates of K-Cr(VI)-jarosites (KFe3[(SO4)2 − X(CrO4)X](OH)6). Temperature (T) was the variable with the strongest effect, followed by pH in acid/alkaline medium (H3O+/OH−). It was found that the substitution of CrO4 2−in Y-site and the substitution of H3O+ in M-site do not modify the dissolution rates. The model that describes the dissolution process is the unreacted core kinetic model, with the chemical reaction on the unreacted core surface. The dissolution in acid medium was congruent, while in alkaline media was incongruent. In both reaction media, there is a release of K+, SO4 2− and CrO4 2− from the KFe3[(SO4)2 − X(CrO4)X](OH)6 structure, although the latter is rapidly absorbed by the solid residues of Fe(OH)3 in alkaline medium dissolutions. The dissolution of KFe3[(SO4)2 − X(CrO4)X](OH)6 exhibited good stability in a wide range of pH and T conditions corresponding to the calculated parameters of reaction order n, activation energy E A and dissolution rate constants for each kinetic stages of induction and progressive conversion. The kinetic analysis related to the reaction orders and calculated activation energies confirmed that extreme pH and T conditions are necessary to obtain considerably high dissolution rates. Extreme pH conditions (acidic or alkaline) cause the preferential release of K+, SO4 2− and CrO4 2− from the KFe3[(SO4)2 − X(CrO4)X](OH)6 structure, although CrO4 2− is quickly adsorbed by Fe(OH)3 solid residues. The precipitation of phases such as KFe3[(SO4)2 − X(CrO4)X](OH)6, and the absorption of Cr(VI) after dissolution can play an important role as retention mechanisms of Cr(VI) in nature. Chromium (Cr) is one of the most strategic materials in the world. Due to its toxic nature, Cr poses several environmental problems, namely waste products, such as mining waste and battery slag disposed of after manufacturing. Waste products, usually contain Cr(VI) as chromic acid, but also a low amount of reduced Cr(III) and Cr as solid metal . High Cr content solutions released in soils by leakage or inadequate waste disposal by industrial facilities can alter the chemical environment of soils. This can result in the dissolution of minerals native to the soil, or in the precipitation of new phases that have the capability to incorporate high concentrations of Cr. These precipitates can limit the mobility of Cr(VI) and therefore, its bioavailability, like the Cr phase identified by Baron et al. in soil polluted by chromate solutions. These phase was identified as KFe3(CrO4)(OH)6, which is the structural analog of jarosite KFe3(SO4)(OH)6. Sulfate is a natural component of soils and underground waters, and it is present in chromate solutions, which are one of the main causes of pollution by Cr. Sulfate and chromate have the same equivalent charge (2−), same crystal structure and similar ionic radii (2.30 Å for SO4 2− and 2.40 Å for CrO4 2−). Additionally, an extensive literature search related to the formation of solid solutions in the alunite/jarosite group suggests the existence of the solid solution KFe3[(SO4)2 − X(CrO4)X](OH)6 between jarosite and its chromate analog [3, 4]. The presence of these solid solutions could have important implications in the mobility of Cr(VI). Understanding the dissolution reactions of these solid solutions is notably important for an environmental assessment of the effects of chromium, because Cr(VI) frequently enters the environment . Jarosite, its chromate analog and its solid solutions belong to the alunite supergroup, whose general formula is MY3(ZO4)2(OH)6, where M = Na+, K+, Ag+, Rb+, H3O+, Tl+, NH4 +, ½ Hg2+, ½ Pb2+; Y = Fe3+, Al3+, Cr3+, Cu2+, Zn2+; Z = S(VI), Cr(VI), As(V) or P(V). The alunite supergroup is composed by three mineral groups: alunite group, where ZO4 is represented by SO4 as dominant anion in the minerals; beudantite group, where one of the two SO4 groups is replaced by PO4 or AsO4; crandallite group, where ZO4 is represented by one or both PO4 and AsO4. The combination of these groups can form more than 40 different compounds . Particularly in jarosite-type compounds, Y-site is occupied by Fe3+, and Z-site is occupied by S(VI). Although nine jarosite compounds can be synthesized, only six of them have been found in nature as minerals, the most common being sodium, potassium and hydronium jarosite. Silver, ammonium and lead jarosite have been also found in nature . Rubidium, thallium and mercury jarosites are considered pure phases, because they can completely substitute M-site, even if they can only be obtained by synthetic means [8, 9]. Substitution in M-site of hydronium ions by potassium or sodium ions shows that most of the jarosite-type compounds are solid solutions of hydronium jarosite [10, 11]. Partial substitutions by Cs+ and ½ Cd2+, and null substitution of Li+ on M-site have been reported by Dutrizac and Jambor , and Dutrizac . Besides the substitutions on site M-site, it is well established that several species can substitute Fe, SO4, and at a lesser extent, OH, which are structural components of jarosite-type compounds . Complete substitutions of Al(III), In(III), Ga(III) and Cr(III) on Y-site as well as a partial substitution by Tl(III) have been reported. In contrast, substitutions by Y(III), Sc(III), U(III) and others rare earths do not occur. Complete and partial substitutions of SO4 2− on Z-site by SeO4 2−, CrO4 2− and AsO4 3−, and partial substitutions of F− by OH− have been observed in synthetic and natural jarosites [3, 7, 8, 10, 12], [14–23]. As it can be noticed, jarosite-type compounds can undergo several kinds of substitutions thanks to the different coordination environments in its structure. Some of those substitutions can be made by elements of environmental importance, such as Tl+, ½ Pb2+, ½ Hg2+, ½ Cd2+, Tl3+, Cr(VI), As(V), and these compounds can work as temporary deposits of these species, thus reducing their environmental impact. Jarosite-type compounds are naturally formed under acidic conditions, during oxidation of sulfurous mineral deposits or ores that contain sulfide, namely pyrite . This is mostly due to supergenic and hydrothermal processes . However, they are also commonly found in places polluted by acid rock drainage (ARD) and acid mine drainage (AMD). The precipitation of jarosites is also used in the hydrometallurgical industry in the elimination of Fe and other impurities in acid solutions from leaching processes of zinc sulfate, copper sulfate and cobalt sulfide . Several studies have been conducted in order to understand the precipitation/dissolution process of natural and synthetic jarosite-type compounds [3, 4, 20], [27–29]. These works have been focused mainly on studying the effects of pH on the dissolution of K, Pb, Pb-As and K-Cr jarosites using different reaction media. It is worth mentioning that these research studies were conducted in the steady state of the dissolution reaction (i.e. in equilibrium). Likewise, research has been developed focusing on the initial states of the reaction of K, Na, K-As and Na-As jarosites, where the highest release of species into the solution has been reported [30–35]. In addition, research studies have been conducted in order to know the thermodynamic properties, , [36–38] and dissolution for the recovery of metal values, like Ag, from Ag, Pb-Ag, Na-Ag, K-Ag, NH4-Ag and industrial NH4 jarosites [39–45]. The aim of this paper is to present a detailed kinetic study on the dissolution of potassium jarosite, its chromate analog, and its solid solutions under extreme temperature and pH conditions, in order to obtain information for the assessment on the potential environmental impact of Cr(VI) in the initial stage of the dissolution reaction (far from equilibrium). Variables, such as pH (acidic/alkaline medium), temperature, initial particle diameter, and Cr(VI) content in the structure were studied. For this it was necessary to: (i) synthesize and characterize a potassium jarosite sample, as well as its chromate analog and its solid solutions; (ii) select the kinetic model that describes the dissolution process and controlling stage; (iii) assess the effects of the variables on the reaction rate (pH, T, d0 and CrO4/SO4); (iv) determine kinetic parameters. Iron (III) sulfate n-hydrate, anhydrous potassium sulfate, potassium chromate, iron(III) nitrate 9-hydrate, sulfuric acid (97.9 %), hydrochloric acid (37.3 %) and sodium hydroxide were used in reagent grade. Ultrapure water (18 MΩ cm) was used in the preparation of the synthesis solutions and in all the dissolution experiments. K, Fe and Cr standards (1000 mg L−1) were used in the quantitative analyses and in the follow-up of the reactions. The chemical reagents were purchased from Baker, and standards from PerkinElmer Pure. The synthesis technique for jarosite-type compounds has been widely described by different authors. We used the same technique as Reyes et al. and Patiño et al. . The solid solutions of KFe3[(SO4)2 − X(CrO4)X](OH)6 were synthesized by controlling a mixture of Fe2(SO4)3∙nH2O/K2SO4/K2CrO4/Fe(NO3)3∙9H2O in 1 l total volume. Initial Fe3+ content, alkali and pH are relevant factors in the synthesis of jarosite-type compounds. When the concentrations of Fe3+ and K+ in the initial solution increase, the reaction yield increases directly, so reagent concentrations well over stoichiometry were used. pH in each synthesis was adjusted between 1.2 and 1.6 with H2SO4 (20 % v/v) to avoid low yields and formation of unwanted phases . A total of 7 syntheses were conducted. The solutions’ compositions are summarized in Table 1. For the elemental analysis, it was necessary to dissolve a sample of each of the obtained precipitates (1 g) in a 1:1 solution of water-concentrated hydrochloric acid. The solutions were analyzed in a PerkinElmer Analyst 200 atomic absorption spectrometer (AAS) to determine K, Fe and Cr. SO4 2− was determined by gravimetric analysis as BaSO4. The obtained solids were also analyzed by X-ray diffraction (XRD) with a SIEMENS D-500 using Cu Kα radiation (1.54056 Å). 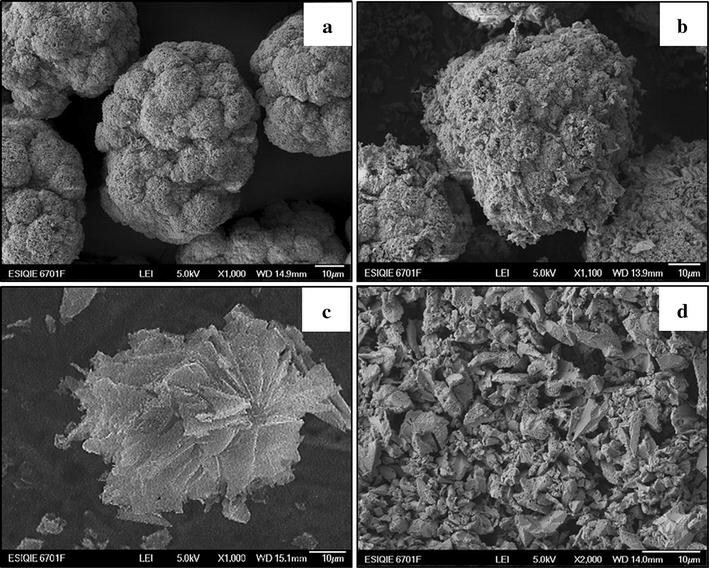 Morphology of the solids was examined using a JEOL JSM-5900LV scanning electron microscope (SEM) equipped with a noran energy dispersive X-ray spectrometer (EDS). The precipitates were also characterized using a Perkin Elmer–Frontier fourier transform infrared (FT–IR) spectrometer equipped with an attenuated total reflectance (ATR) accessory to confirm water in the crystal structure and to validate the presented formulae. The obtained precipitates were wet-sieved to separate them by particle size with the Tyler mesh size series (USA Standard Testing Sieve, ASTME-11 specifications). The used mesh sizes were the following: 120 (d0 ≥ 125 μm), 170 (125 < d0 ≥ 90 μm), 200 (90 < d0 ≥ 75 μm), 270 (75 < d0 ≥ 53 μm), 325 (53 < d0 ≥ 44 μm), 400 (44 < d0 ≥ 38), and 500 (38 < d0 ≥ 25 μm). 0.2 ± 0.0001 g of the synthesized solid were used in an initial volume of 500 ± 0.0002 mL for all the experiments. The acidic conditions were obtained through dilutions of concentrated HCl (37.3 % purity), and the alkaline conditions through direct NaOH pellet weighting. For low concentrations, it was necessary to conduct dilutions of an initial NaOH 0.1 mol L−1 solution. The solution of each experiment was placed in a (Pyrex) glass reactor and set on a heating plate with automatic temperature control and mechanical stirring at a rate of 750 min−1 to avoid particle fragmentation. In all the decomposition experiments pH was kept constant by adding low volumes of a concentrated NaOH or HCl solution correspondingly (1.0 mol L−1). Progress of the dissolution reaction was monitored by taking samples of the solution (5.0 ± 0.01 mL) at different times established according to the total reaction time (tr) of each experiment (≈20 samples per experiment). Each sample was analyzed for potassium by AAS (it was previously filtered with Whatman # 42 filter paper to remove solid residues). Alterations due to sampling and reagent addition were corrected through mass balance. The effects of H3O+/OH− concentration, temperature (T), particle initial diameter (d0) and Cr(VI) proportion in the structure (SO4 2−/CrO4 2−), were studied by changing a parameter and keeping the other three constant in each experiment. pH readings are essential in this work, so it was intermittently measured for each experiment in the bulk of the solution using an Orion 3 star pH-meter equipped with a thermo ultra sure flow electrode with a reading precision of pH ± 0.01, and use range of 0–14 at a maximum temperature of 100 °C. It also has an automatic temperature compensation electrode with an accuracy of T ± 0.5 °C. During the average pH measurement time (≈30 s) the loss of filling solution is minimal and can be considered that the filling solution does not contaminate the sample. The syntheses under the conditions in Table 1 produce, from 30 g for the chromate analog of potassium jarosite (S1) (this output grows as the substitution of SO4 in the structure increases), to 70 g for potassium jarosite (S7), where the substitution of Z-site by S(VI) is total. A possible explanation for the preferential incorporation of sulfate is that in synthetic acidic solutions, Cr(VI) is mainly present as HCrO4 −, and the CrO4 2− concentration, which is incorporated into the precipitated solids, is low compared to the total concentration of Cr(VI) in the solution. On the other hand, sulfur is preferentially present as SO4 2− . Precipitate color varies from red in KFe3(CrO4)(OH)6 to the characteristic yellow color of jarosite in S7. The chemical analysis shows that, of the seven syntheses we carried out, only S1 has a stoichiometry close to the ideal formula of jarosite-type compounds MFe3(ZO4)2(OH)6, with a molar proportion K/Fe/CrO4/OH of 0.95/3.04/1.99/6.01, compared to the ideal 1/3/2/6 proportion. Deviations from the ideal formula in syntheses S2 to S7 are due to K+ deficiencies attributed to the substitution of H3O+ and the deficiency of Fe3+, which is compensated by the conversion of OH− to H2O. These deficiencies have also been observed on other natural and synthetic jarosite-type compounds [15, 19, 20, 27]. By considering the molar relations K+ + H3O+ = 1, SO4 2− + CrO4 2− = 2 and OH− = 3Fe3+ −3, it is possible to calculate the approximate formulas shown on Table 1. 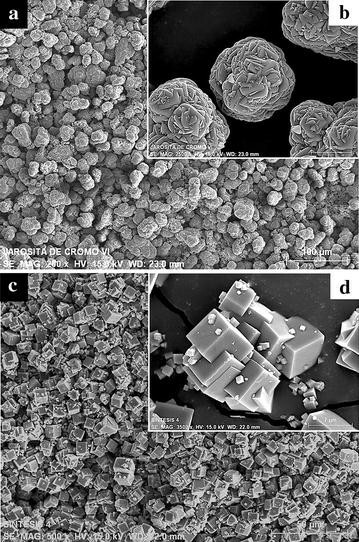 SEM images show that, for syntheses S2 to S7, the precipitates are mainly composed of spheroidal aggregates with a diameter between 20 and 90 µm (Fig. 1a), which are typical of synthetic jarosite-type compounds. Regarding the chromate analog of potassium jarosite, S1 is composed of intergrown crystals with cubic euhedral morphology, as seen on Fig. 1c, with crystallite sizes ranging from 1 to 10 µm for all the synthesized solids (Fig. 1b–d). EDS analyses of all the precipitates show uniform concentrations of K/Fe/S/Cr. The XRD patterns obtained from the precipitates were compared to those of the International Center for Diffraction Data-Powder Diffraction Files. The results are presented in Fig. 2a. All of the synthesized solids were identified as jarosite-type compounds. S1 was compared to the pattern KFe3(CrO4)(OH)6 reported on card ICDD-PDF 000-020-0894, and all the peaks were identified as KFe3(CrO4)(OH)6. Precipitates S2, S3, S5, S6 and S7 were similar with card ICDD-PDF 000-036-0427, which corresponds to [K(H3O)]Fe3(SO4)(OH)6. As observed in Table 1, in the range between S2 and S6, S4 is the precipitate with the least amount of H3O+ in its structure, so all the XRD signals of this solid were identified as KFe3(SO4)(OH)6 (ICDD-PDF 000-022-0827). The absence of unidentified peaks indicates that there are no other crystal phases at detectable levels in any of the synthesized solids. A slight offset in the main signals of the solids can be observed as Cr content grows (Fig. 2b) towards smaller angles (2θ), representing slightly larger d-spacings of the jarosite’s chromate analog, because the unit cell volume of KFe3(CrO4)(OH)6 is slightly higher than the volume of KFe3(SO4)(OH)6. This slight change indicates a continuous solid solution instead of a two-phase mixture, because in case of a mixture, different groups of peaks of each phase would be present, and the intensity of those peaks would be the separate function of each phase’s fraction in the mixture . The FT-IR results (Fig. 3) for the solids synthesized in this study are very similar to other previously reported studies on natural and synthetic jarosite-type compounds [2, 11, 27, 47]. The two most intense peaks, near 1086 and 1187 cm−1, occurred due to the stretching vibration ν3, and the double peak observed near 633 cm−1 occurred due to the bending vibration mode ν4, both in SO4 2−. The band that appears at approximately 3372 cm−1 is mainly due to the stretching mode of OH−, and it also includes vibration modes of water, especially for synthetic samples where there is a substitution by H3O+ in the cationic position. The water band appears at approximately 1630 cm−1, which is similar in all of the synthesized solids. Besides, in S1, where the substitution of CrO4 2− is total, it is possible to observe the mode ν3 of CrO4 2− (925 and 845 cm−1) and the deformation of OH− at 1005 cm−1. Between S1 (492 and 422 cm−1) and S7 (511 and 471 cm−1) the vibration modes of the octahedral coordination of FeO6 can be observed. In the shaded area on Fig. 3 it is possible to observe how the substitution of CrO4 2− by SO4 2− takes place, and the distinctive vibration modes of both species in one same compound are clearly visible between S2 and S6, which confirms the solid solution between KFe3(CrO4)(OH)6 and KFe3(SO4)(OH)6. XRD and FT-IR results confirm the stoichiometry of the synthesized solids (shown in Table 1). Several samples of S4 were treated with an HCl and NaOH solution at different T and d0 conditions. The solutions were analyzed for K by AAS at different time intervals, and the remaining solids were characterized by SEM–EDS and XRD. Levenspiel  states that, for non-catalytic reactions of solid particles with a surrounding fluid, two kinetic models are considered: the progressive conversion model, where the reacting fluid penetrates and reacts throughout the particle, and the unreacted core model, where the reaction first takes place on the external surface of the solid particle, and then it moves inside the solid, leaving completely transformed material (ashes) behind. Therefore, during the reaction there will be an untransformed material core, whose size will decrease as the reaction progresses. For the dissolutions in OH− medium, when cutting and examining the transversal section of particles that have partially reacted (Fig. 4a), it is possible to observe solid material that has not reacted (core), surrounded by a halo (ash layer). EDS analyses show the presence of Fe, Cr and O in the halo (Fig. 4b), while K+ and SO4 2− have diffused into the solution, while it is possible to notice the presence of K, Fe, S, Cr and O in the core (Fig. 4c), indicating that it has not reacted. The Au and C signals appear because the sample was fixed in resin and covered in gold. Regarding the dissolutions in H3O+ medium, there is no formation of ash layer, because the reaction products are soluble and also there are detachments of flakes. Therefore the particle’s size decreases during the reaction until it totally disappears. This process is represented in Fig. 5a–d. EDS analyses of the solids for each stage show uniform concentrations of K/Fe/S/Cr/O. As it can be noticed, the unreacted core model for spherical particles with the formation of an ash layer satisfactorily describes the dissolution process of jarosite-type compounds in OH− media and most of the reactions in acidic media, specifically the developed at high concentrations of H3O+. In the case of the reactions developed at low concentrations of H3O+, the model that describes the process is the unreacted core model for spherical particles without the formation of an ash layer. where X is the KFe3[(SO4)2 − X(CrO4)X](OH)6 fraction that has reacted, A t is the amount of K in the solution at a given time t, and A τ is the amount of K when the reaction has reached steady state. Figure 6a shows the effect of time on the conversion of K+ and SO4 2−into a product for the dissolution of S4 in OH− medium. It is possible to notice an induction period in the dissolution curve, where there is no change in color or in the morphology of the particles. This stage is related to the difficulty of absorption of OH− ions on the particles’ surface to form active sites; the duration of this period is known as induction time (tind). The end of the induction period is identified by a change in color, going from red to grey, and it indicates the establishment of a reaction front, where the concentration of K+ and SO4 2−and CrO4 2− progressively increase (progressive conversion) until reaching a steady state. This indicates the end of the dissolution reaction (stabilization period). The shape of the curve presented in Fig. 6a is common for most of the dissolution reactions conducted for this study in both reaction media. For the reactions in acidic medium conducted at low [H3O+] (<0.07 mol L−1), a dissolution curve similar to that presented in Fig. 6b was obtained. It can be observed that, after 1250 min of reaction, there is a sharp change in the slope, which indicates a change in the reaction rate. This can be attributed to the fragmentation of particles, as observed in Fig. 5d, where particle diameter shrinks drastically, thus increasing the contact area, which in turn increases the reaction rate. This change appears to be very evident in these reactions because they are slow compared to those conducted at high temperatures and pH. The reaction progress followed by XRD in OH−medium, Fig. 7a, corresponds to the data presented in Fig. 6a. It can be noticed that, while the concentrations of K+ and SO4 2−increase in the solution, the reflection intensities of the XRD peaks gradually decrease until they disappear; the solid residues are amorphous and do not evolve into new crystal phases. Decomposition in acidic medium (Fig. 7b) at low concentration of [H3O+] (≤0.07 mol L−1 of HCl ≈ pH = 1.13 for T = 30 and 50 °C) results in an incomplete solid dissolution using steady state conditions for calculation of the conversion. The residual solid was identified by DRX and SEM–EDS as KFe3[(SO4)2 − X(CrO4)X](OH)6; with no evidence of the formation of secondary phases. Also in Fig. 6 was demonstrated that can be use any value of conversion of the present ions for the calculation of constant rates for both reaction media (Fe, Cr, SO4), since it was demonstrated to have the same dissolution rate. For convenience only are presented the values of conversion of potassium. In Eqs. 2, 3 and 4, X is the KFe3[(SO4)2 − X(CrO4)X](OH)6 decomposed fraction, k exp is the experimental rate constant and t is time . For the confirmation of any of the three equations, an experiment was conducted where [H3O+]/[OH−], T, d0 and Cr content in the structure were kept constant, and the conversion was determined at different times. A representation of Eqs. 2, 3 and 4 in function of time should be linear, the slope is k exp and the intersection with t is the induction time (t ind ), which represents the induction period duration. [30, 32, 49]. Figure 8 corresponds to the assessment of Eqs. 2 and 3 with the data obtained in Fig. 6. As it can be noticed, the assessment of Eq. 2, which corresponds to a chemical control, matches the linear requirement for the decomposition in OH− medium very well. For the decomposition in H3O+ medium at low [H3O+], the equation that best matches the linear requirement is, surprisingly, Eq. 3, which corresponds to the unreacted core model with diffusion control in the solid product halo, and according to SEDM–EDS results, there is no formation of ashes under these reaction conditions. Therefore, the hypotheses on which the model is based may not completely describe the real process, e.g. the reaction can occur along a diffused front instead of doing it on a defined surface between the unreacted solid, the ashes or the fluid layer, so it corresponds to an intermediate behavior between the two mentioned models and controlling stages . Consequently, the unreacted core model with its respective controlling stages is the model accepted to describe the dissolution process of potassium jarosite, its chromate analog and its solid solutions in [H3O+]/[OH−] media after the induction period. where b is a stoichiometric coefficient, D e is the effective diffusion coefficient in a porous structure (cm s−2), C A is the reactant concentration ([H3O+]), ρ J is the molar density of S4, and d 0 is the particle initial diameter in µm. Notice that the reaction order in this equation is n = 1. Figure 6a and b shows the dissolution curve shape of all the experiments conducted in both reaction media. All the experimental data are summarized in Table 2 for OH− medium, and in Table 3 for the reactions in H3O+ medium. [OH−] in Table 3 was determined through the initial pH and the ionization constant of water (kw) at working temperature in each experiment . After calculating the conversion X for all the experimental data and applying Eq. 2, and in its case, Eq. 3 to obtain k exp and t ind , it is possible to obtain the reaction order n and activation energy E A (kinetic parameters), as reported by Patiño et al. [33, 34], 2013 for each medium and controlling stage for dissolutions of jarosite type-compounds. Calculations are shown in Figs. 9a, b and 10a, b for reaction order and for activation energy, respectively. The results of the kinetic parameters calculated are summarized in Table 4. It was found that in all of the dissolution experiments, the dissolution reaction is extremely dependent on temperature and pH. The highest dissolution rates were obtained at high temperatures and high [H3O+]/[OH−] concentrations (see Tables 2, 3). For instance, in the dissolution in OH−medium at a pH of 12.29 and a temperature of 60 °C (343 K), the steady state was reached just after 2 min of reaction. On the other hand, the slowest reaction in this medium was obtained in the experiment with pH 10.79 and T = 30 °C (303 K), and the steady state was reached after 2100 min (≈1.5 days). The reactions in H3O+ were slower compared to those conducted in OH−medium, with the quickest reaction at a pH of 0.21 and a temperature of 80 °C (353 K), reaching the steady state after 8 min of reaction, and the slowest at pH 1.69 and T = 30 °C (303 K), where the steady state was reached after 13,500 min (≈10 days). All the conducted reactions underwent a pH change during the reaction, and it was more evident in the reactions in OH− medium. These changes in pH are related to the high consumption of OH−/H3O+ions, mostly at the start of the reaction, corresponding to short induction periods. This fact is related to the reaction orders (n) that correspond to the induction period in both reaction media (Table 4). It can be noticed that the reaction order in OH−medium (n = 1.1) is slightly higher than that observed in H3O+ medium (n = 1.05 and 0.47). This difference is related to a higher dependence of the reaction on [OH−]; therefore, there is a higher OH−consumption, which is reflected in a drastic pH decrease. SEM–EDS results (Figs. 4, 5), as well as the results shown on Fig. 8, confirm that the unreacted core shrinking model satisfactorily describes the dissolution process of KFe3[(SO4)2 − X(CrO4)X](OH)6. Dissolutions in OH− medium are characterized by the formation of a halo of solid residues made of Fe(OH)3 that surrounds an unreacted core, while K+ and SO4 2− are preferentially released from the particle into the solution. The presence of this layer does not limit the dissolution rate, because, according to the calculations shown in Fig. 8, the stage that controls the process, or slow stage, is the chemical reaction (breakage of Fe–O bonds) on the surface of the unreacted core. Similarly, the stirring rate has no effect on the dissolution rates, because being a chemical control, the reagent diffusion process is quicker compared to the chemical reaction, even if at low [H3O+], diffusion plays an important role. In the same manner, according to SEM–EDS results (Fig. 5), the decompositions in H3O+ medium at low [H3O+] are described by the unreacted core model without the formation of the solid product layer, even if the results in Fig. 8 point to an intermediate behavior between controlling stages (diffusion in the ash layer and diffusion in the fluid membrane). The conversion-time equations (Eqs. 2–4) consider a single resistance throughout the reaction of the particle. However, the relative importance of diffusion of the fluid film in both the ash layer and the reaction stage varies as the reaction progresses. For a particle of constant size, the resistance in the fluid film remains constant and the resistance of the reaction diminishes, as the surface of the particle unreacted core decreases. The resistance of the ash layer does not exist at the beginning of the reaction (since there is not ash); but it becomes progressively more important as the ash layer is formed. Perhaps, it is not reasonable to consider that a unique stage controls the rate of the overall reaction. On the other hand, when a solid ash is formed during the reaction (as in the case of the dissolution reactions in OH− media), the resistance of this layer is much greater than the resistance through of the fluid film that surrounds the particle. Therefore, the resistance of the fluid film may be neglected when the reaction does not form a not-flaky ash. In addition, the resistance of the ash layer is not affected by changes in the fluid velocity that surrounds the particle. In the case of reactions carried out at low concentrations of H3O+, when the controlling stage was the matter transport in the ash layer (although SEM results did not show formation of such layer at the reaction conditions used in this study), it is possible that the solution being strongly stirred (750 min−1) eliminates the resistance of the fluid layer, staying only the resistance offered by the flaky ash, as it is shown in Fig. 5b. The presented results are fairly coherent with previous studies on the dissolution of jarosite-type compounds [30, 39, 40–45, 51]. The dissolution rates obtained in this study are similar to rates previously obtained in other studies on synthetic jarosite-type compounds: NH4, Ag, K-As, Na-As, Pb-Ag, Ag-NH4, Na-Ag. As it can be noticed, the substitutions are site M and site Z; it is worth mentioning that these studies were conducted in the initial stage of the reaction (far from equilibrium) in OH− medium [30, 39, 40–45, 51]. For instance, in Fig. 12, the results of the dissolution of K-As and Na-As jarosites in NaOH and CaO media are compared to the results obtained for this paper. It can be seen that the behavior of the dissolution rates is very similar, even if they were conducted at different [OH−] and T conditions. This indicates that the substitutions, whether on Y-site or Z-site, have little effect on the dissolution rates of jarosite-type compounds. In addition, under alkaline conditions, the dissolution produces secondary solids (iron hydroxide). However, Flores et al. and Patiño et al. found that, for the dissolution of K-As and Na-As jarosites in NaOH and CaO media, at a pH of ≈11.5 or lower, there is a reaction order of n = 0 (Fig. 12), which suggests that there is no dependence of the dissolution reaction on the [OH−] of the medium. Kendall et al. suggest that the incorporation of As in the jarosite structure limits the efficiency of the OH−attack on the particle surface, resulting mostly in a H2O attack. This change in the mechanism can be due to the arsenate bonds on the surface, creating electrostatic repulsion of the hydroxyls at a high pH; besides, the increase in the number of Fe-AsO4 bonds inhibits these systems’ dependence on [OH−]. This phenomenon was not observed in the dissolution of K-Cr-jarosites since they were not found reaction orders n = 0, indicating a continuous dependency of the reactions towards concentrations of H3O+/OH−. The dissolution of KFe3[(SO4)2 − X(CrO4)X](OH)6 shows a high dependence on [H3O+] and [OH−]; the calculated reaction orders (Table 4) show that the dependence of the dissolution reaction on the reaction medium is similar for both reaction media and periods, because the calculated reaction order is n = 1.0 for all the cases. This n value indicates that the obtained dissolution rates are directly proportional to the reactant concentration, which means that low concentrations correspond to low reaction rates, and vice versa. Nonetheless, the reaction order calculated for the induction period in [H3O+] medium at 50 °C, proved to be much lower than expected (n = 0.47), which indicates that [H3O+] concentration under these conditions has little influence in the reaction, even at high concentrations, as the beginning of the reaction is mainly affected by temperature. Temperature was the variable with the strongest effect on the dissolution of KFe3[(SO4)2 − X(CrO4)X](OH)6. For instance, for one same [H3O+], at 30 °C (303 K), the reaction had a duration of 2280 min, while at 80 °C (353 K), the reaction reached the steady state in only 30 min. In the same way, temperature affects the dissolution rate in the induction period to such extent, that at high reaction temperatures, this period disappears. Therefore, the formation of active sites and the beginning of the progressive conversion period are instantaneous. The energy dependence (E A ) calculated in the progressive conversion period was lower than in the induction period in both reaction media (see Table 4). This noticeable difference is related to the difficulty in chemical adsorption and subsequent establishment of a reaction front of H3O+/OH− ions on the superficial active centers, which are very stable, so the energy demand is higher in the induction period. According to Eq. 5, a representation of the experimental constants determined at constant temperature and concentration vs. the inverse of the particle diameter, should be linear and pass through the origin. Figure 13a presents the dependence of kexp on the particle’s initial diameter d0. From this plot we can deduce that the experimental constant is inversely proportional to the particle diameter (kexp α 1/d0), so the dissolution of KFe3[(SO4)2 − X(CrO4)X](OH)6 in H3O+/OH− medium is consistent with the unreacted core model with chemical control. However, the induction period is practically independent from the particle size, as observed in Fig. 13b. Results of the experiments on the dissolution of potassium jarosite, its chromate analog and the 5 synthesized solid solutions (S1–S7), conducted at constant [H3O+]/[OH−], T and d0, are shown in Fig. 14. As it can be seen in the dissolution curves (Fig. 14a), similar dissolution rates were found in the 7 dissolution experiments, so the incorporation of CrO4 2− into the structure of potassium jarosite does not modify the dissolution rate, even when the substitution of CrO4 2− is total in both reaction media. The comparison of the calculated rate constants vs. SO4 2−/CrO4 2−proportion (Fig. 14b) clearly confirms that the dissolution rate is not modified and there is no behavior tendency due to the presence of the chromate ion in the structure. Likewise, these results can be applied to the substitution in the M-site, since, according to Table 1, several proportions of H3O+ in the structure are incorporated into the produced syntheses. This incorporation difference is more evident between S1 and S7. Results show that even a high substitution of H3O+ does not modify the dissolution rate. As previously mentioned, this similarity between dissolution rates is due to the fact that the stage limiting the reaction is the chemical reaction with the breakage of Fe–O bonds on the surface of the particle. Although the nature of the species that substitutes in Z-site can have an influence on the dissolution rates (for example, on the dissolution rates of K-As and Na-As jarosite), it was found that the dissolution rate is modified when the incorporation of As is increased. The results of this and other studies indicate that jarosite-type compounds are excellent deposits for elements of environmental importance, such as Cr(VI) and As(V), because they have high stability in a wide range of pH and T. They are more stable at an acidic pH and low T, e.g., according to the results obtained in this study, K-Cr jarosite showed extremely slow dissolution rates at a pH 1.5, indicating that a high pH value will result in even slower dissolution rates. On the other hand, even though the stability in alkaline media was lower compared to the dissolutions in acidic medium and relative to quicker dissolution rates even at moderately high pH values (pH 10.5), the release of Cr(VI) into the solution is not immediate, because after the dissolution of KFe3[(SO4)2 − X(CrO4)X](OH)6, there is a quick adsorption of Cr(VI) on the residues made of Fe(OH)3, which delays this element’s access into the environment. Therefore, the precipitation of phases such as KFe3[(SO4)2 − X(CrO4)X](OH)6, and the adsorption of Cr(VI) after the dissolution can play an important role as retention mechanisms of Cr(VI) in nature. In addition, chromate ions can also be adsorbed by aluminum oxides, kaolinite, montmorillonite, organic complexes and other clay minerals that are common components of soil. This adsorption is favored by a decrease in pH, and it was found that the highest chromate adsorption is in acidic to neutral conditions in the presence of iron oxyhydroxides  such as hematite, schwertmannite, maghemite and ferrihydrite; that are products of the dissolution reaction of the jarosite-type compounds and presence of any of these iron oxyhydroxides vary according as function of temperature and pH . Moreover, the fact that sulfate is preferentially incorporated into KFe3[(SO4)2 − X(CrO4)X](OH)6 formed by synthetic acid solutions implies that the formation of this phase is possible even at low sulfate concentrations, and the fact that the yield of the precipitation reaction increases along with the sulfate concentration indicates that the capability of KFe3[(SO4)2 − X(CrO4)X](OH)6 to keep low Cr(VI) concentrations in solution is better than a pure phase of KFe3(CrO4)2(OH)6. Thus, KFe3[(SO4)2 − X(CrO4)X](OH)6 could limit the mobility of Cr(VI) more than the precipitation of KFe3(CrO4)2(OH)6 . It was also found that the incorporation of CrO4 2− and H3O+ does not modify the dissolution rates, which suggests that regardless of the SO4 2−/CrO4 2− or K+/H3O+ proportion in the structure, the dissolution process is the same. The dissolution of KFe3[(SO4)2 − X(CrO4)X](OH)6 showed a directly proportional dependence on [H3O+]/[OH−], which is represented by the reaction orders calculated for both media and periods. A value of n = 1 (Table 2) indicates that the reaction rate is directly proportional to [H3O+]/[OH−]: very high concentrations are necessary for quick reaction rates, and vice versa. Consequently, a low [H3O+]/[OH−] concentration will cause the beginning of the reaction to be slow, thus delaying the incorporation of Cr(VI) into the environment. An important piece of data obtained in this study is the pH value at which the dissolution of KFe3[(SO4)2 − X(CrO4)X](OH)6 is instantaneous, without an induction period calculated from the representation of log (1/tind) vs. log [H3O+] or log [OH−] (Fig. 9) and the intersection of the linear regression with the x axis (log [H3O+] or log [OH−]). For the dissolutions in acidic medium, this value was pH 0.05, and in alkaline medium it was pH 13.4 at 30 °C, which indicates that extremely acidic or alkaline conditions are necessary for an instant dissolution. Patiño et al. obtained a similar value for the dissolution of Na-As jarosite in alkaline medium (pH 13.6). The energy dependence calculated for the progressive conversion period in both media was much lower (almost half the value) than the E A in the induction period. Consequently, low temperatures will result in slow dissolution rates, even at high [H3O+]/[OH−] (see Tables 2, 3). It was also found that the reaction rates decrease as the initial particle diameter grows, so larger initial particle diameters will facilitate slower dissolution rates, although the particle size effect was not as strong as the effect of T and [H3O+]/[OH−] on the obtained dissolution rates. Potassium jarosite, its chromate analog and 5 solid solutions with different SO4 2−/CrO4 2− proportions in the structure were synthesized. The effect of T, [H3O+]/[OH−], d0, SO4 2−/CrO 4 2−. on the dissolution rate of these phases was studied. The experimental results indicate that the reaction rate is highly dependent on temperature, closely followed by pH of the reaction solution. Generally speaking, the order of importance regarding the effect of the studied variables is as follows: T > [H3O+]/[OH−] > d0 > SO4 2−/CrO4 2−. It was also found that the incorporation of Cr(VI) in the structure does not affect the dissolution rate. Extreme pH conditions (acidic or alkaline) cause the preferential release of K+, SO4 2− and CrO4 2− from the KFe3[(SO4)2 − X(CrO4)X](OH)6 structure, although CrO4 2− is quickly adsorbed by Fe(OH)3 solid residues. Likewise, the experimental results are fairly consistent with the unreacted core kinetic model with formation of a solid sub product layer. In most of the reactions, the chemical reaction is the stage controlling the dissolution process, although in the reactions at low [H3O+] (1.5 ≥ pH ≤ 4.5) and T ≤ 30 °C, the diffusion of H3O+ ions on the unreacted core can play an important role in the dissolution rate of KFe3[(SO4)2 − X(CrO4)X](OH)6. The kinetic analysis related to the reaction orders and calculated activation energies confirmed that extreme pH and T conditions are necessary to obtain considerably high dissolution rates. Therefore, inside the common pH and T intervals of water bodies and superficial soils, it can be considered that the precipitation of KFe3[(SO4)2 − X(CrO4)X](OH)6 can work as Cr(VI) deposit and thus limit its environmental mobility, since it offers a high stability in acidic media. Similarly, the quick adsorption of Cr(VI) on iron residues after the dissolution of KFe3[(SO4)2 − X(CrO4)X](OH)6, offers an additional deposit in environments with neutral to slightly alkaline pH, which is an unfavorable condition for jarosite-type compounds. To make a proper comparison with other dissolution rate values, it is necessary to establish the validity of the kinetic model used in this work mainly for intermediate pH values (2–10), which are the most common conditions found in nature. According to the results, there are differences between the dissolution rates observed under extreme conditions of pH and those obtained at intermediate conditions. Especially in the controlling stage of the dissolution rates, being dominant the chemical reaction in the dissolution reactions at extreme conditions of pH (2.0 ≤ pH ≥ 10.0); and mass transport in the residual solid layer in the reactions at intermediate pH conditions. It is also necessary to consider that in reactions with intermediate pH, unreacted solid remains, calculations of the reaction rates are made in the steady state, and it is not considered the saturation condition of the system. For these reasons, it is still necessary to perform additional experiments taking in account these considerations. IAR designed the experiments, performed analyses, analyzed the data, and wrote the first draft of the manuscript. IM conducted and analyzed most of the experiments and contributed to the discussion and manuscript outline. FP and TP helped with the experiments and suggested revisions for the manuscript. MUF and EGP helped with the characterization of jarosite-type compounds and residual solids. EJG offered experimental design suggestions, helped in final editing and design of the manuscript and suggested the publication journal. MR participated in the synthesis of the jarosite type compounds. All authors read and approved the final manuscript. The authors would like to thank The Autonomous University of Hidalgo State, The National Autonomous University of Mexico, The National Polytechnic Institute and The Institute of Metallurgy of The Autonomous University of San Luis Potosi, for all the facilities to carry out the experimental work. The valuable time and technical assistance of José Manuel Martínez of The Mineral Processing Laboratory at The Institute of Metallurgy of The Autonomous University of San Luis Potosi is duly recognized.